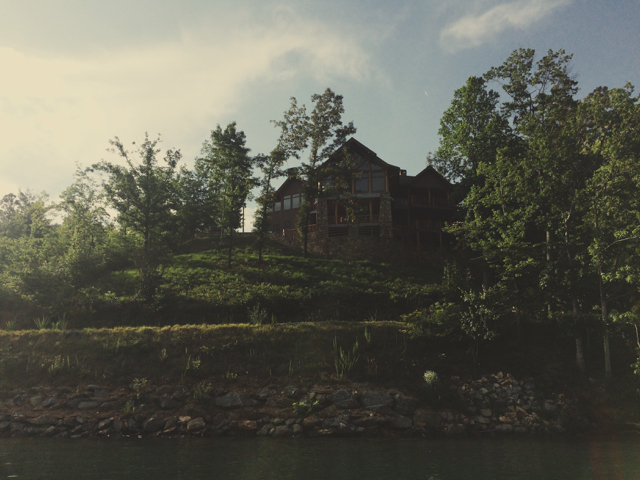 There's a town buried deep beneath the surface of Lake Burton. It wasn't a very big one, boasting a population of only about 200 people. But it was an important one, established in the early 19th century during the Gold Rush. By the time the Georgia Railway and Electric Company bought it in 1917, Burton had become a base for the local mining and logging industries, and the second largest town in the county. Most of its buildings were moved before the dam was closed and the reservoir flooded, but some were left to be destroyed by the rising waters. It's eerie to think about, that underwater ghost town. Almost every night of my stay, when the lake's western edge blushed with dusky pink twilight, I crept down to watch the water turn black. It takes a while. The surface shimmers through several shades of deepening blue, growing ever more still as boaters return to their docks. The shouts and splashes of lingering swimmers echo around the shore, which holds onto the last violet glimmers of light as if reluctant to let go. As if the silent, secret, watery town down below wants a sunset, too. When darkness finally gets ahold of the lake, it's impenetrable. The mountains seem to close in, sealing everything in a deep tranquility that, with its southern strangeness, struck me as deliciously dangerous. God knows what kinds of spiders out there. What poisonous plants along the road behind me. And just beyond, in the hills, what wildness lurks. I'd better go back inside. I've never been on a pontoon boat before. Which makes the dog I'm sitting next to the veteran, and me the n00b. I'm totally okay with this. 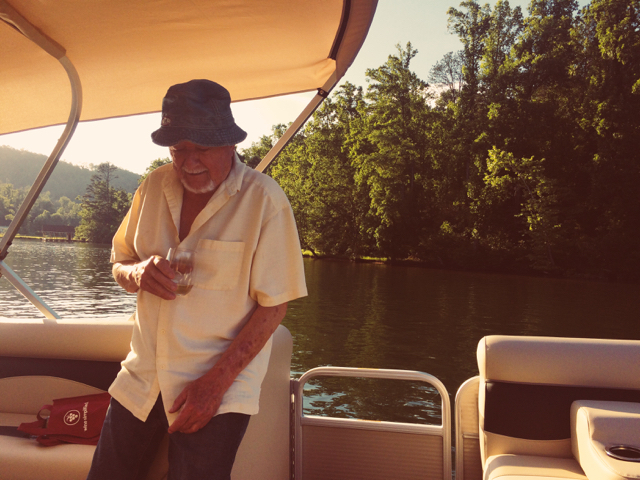 I'm zooming around a 2,775 acre lake, in June, a glass of Sauvignon Blanc in my hand, hanging out with my favorite octogenarian. The man driving the boat is named Woody. The dog is named Zoe. I'm not the only one enjoying a glass of wine. Yep, I'm totally okay with being a n00b today. Zoe and I are at the front of the boat, which is lined on all sides with deep, padded seats. I'm tucked into the corner of one such seat, and Zoe, a standard poodle mix whose poodle-ness dominates her DNA, is at my feet. I'm nervous for her - about her - but I don't need to be. She's clearly done this a million times before. 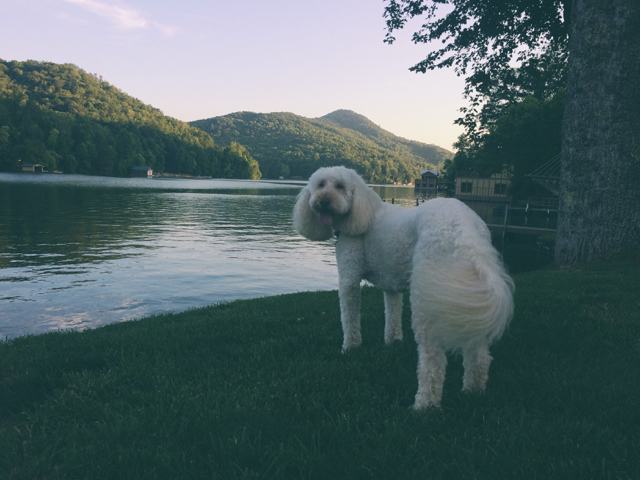 Her ears, fluffy white puffs the fur of which looks expertly crimped, blow back prettily as she gazes at the lake from behind a small metal gate. She's probably in heaven. I know I am. Bill and Woody are a few feet away, conferring about the community. I catch snippets of their talk. Who moved in where, and when. Who moved out, and why. The real estate gossip of locals. 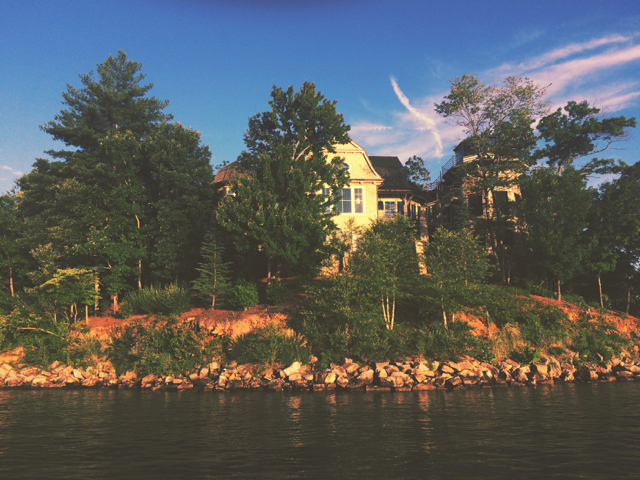 Every so often one of them calls out some fact about the lake's history, or points out an especially striking home. They needn't bother with that, though. I've barely blinked since we pulled out of Woody's boathouse. The houses are jaw-dropping, each more spectacular than the last. 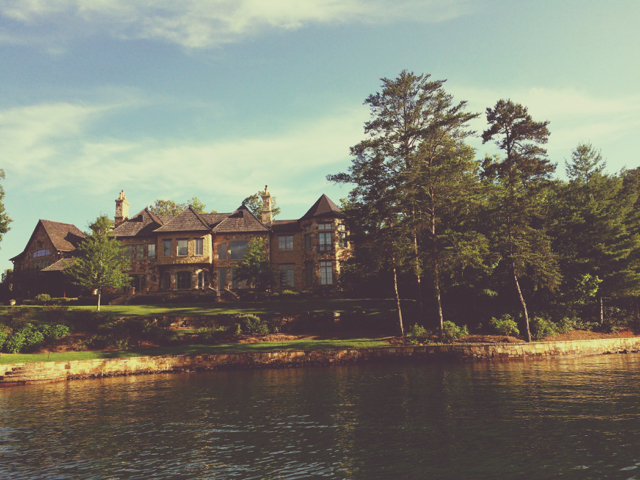 The kind of houses that are beyond envy, beyond aspiration. Another world entirely. The one-percenters. Most are empty save for the few days a year their owners can unchain themselves from whatever high-powered careers financed them. Some tower boldly right over the water, imposing mansions of beam and stone. Some hide demurely behind trees, their massive plate glass windows winking in the sun that breaks through. Woody nods towards one. Twelve fireplaces, he says with a grin. I don't believe him, and quickly scan the castle-like roof. Sure enough, there are twelve chimneys. Twelve goddamn fireplaces. Who are these people? I pet Zoe and marvel. Now Bill's humble jokes about living at the "ghetto end" of the lake make sense. 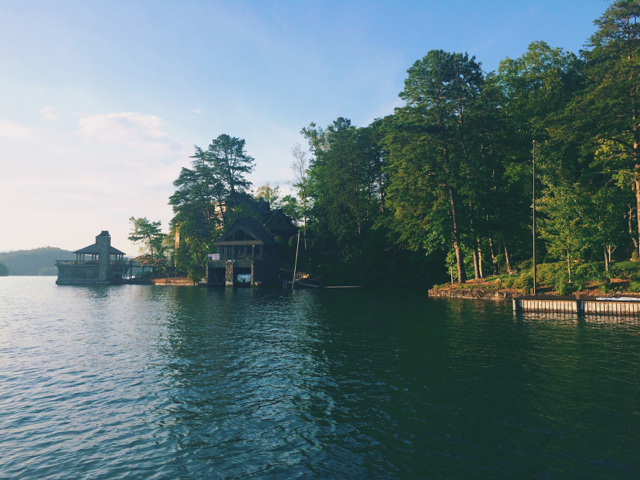 All 62 miles of Lake Burton's shoreline are charming, but some stretches are truly majestic. My host and his friend watch me take it all in. The city girl. Long way from LA. They don't realize that my Michigan roots are tingling with delight right now. I'm only recently a city girl. And I'm not really a desert girl, or a suburb girl, though I've spent most of my life in those. And no way no how am I beach girl. I'm a lake girl. 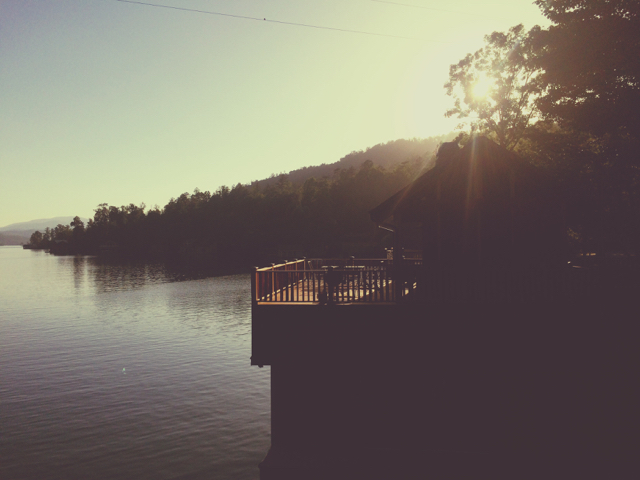 Lakes have always drawn me in like no other landscape does. Peaceful. Contained. Safe. 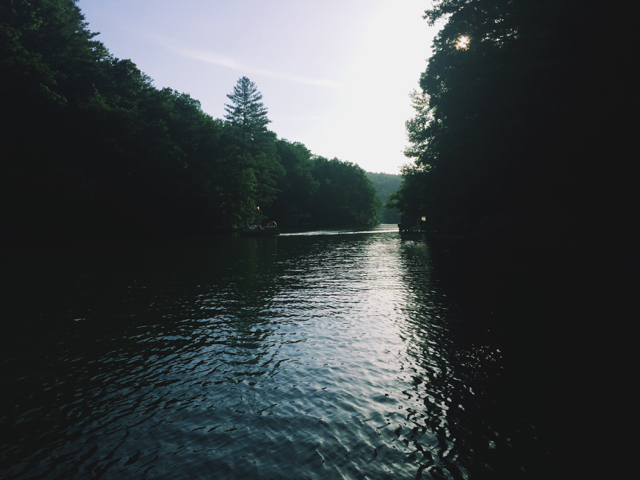 I grew up on a lake and if I'm lucky I'll grow old on one, like these friends of mine. Who knows though, and who cares right now. I'm on a boat with a dog, and we've got wine. The lake branches into multiple narrow fingers that we tool through slowly. It's endless in the best way, and I can't get enough of the green. Every last twig and leaf I put in the pocket of my memory, not knowing when I'll see such lushness again. The three of us point out our favorite houses. I prefer the more modest cabins set back a ways in the woods. I like the idea of running out their back doors, down to the water, jumping in without a moment's hesitation. Woody and I both admire a trim lodge with a pretty green roof; it belongs to a woman they know, and has for years. 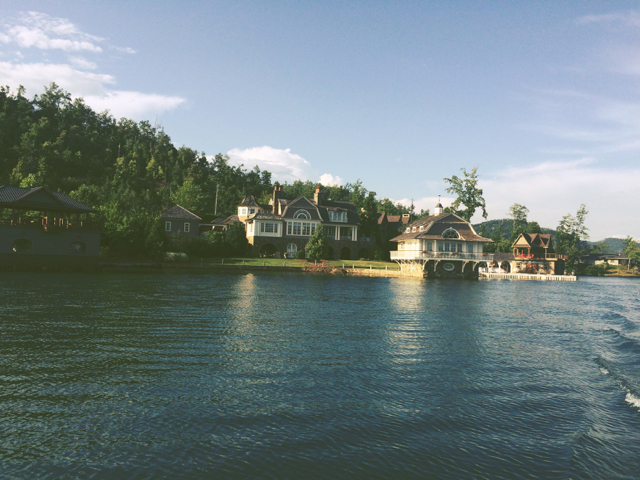 Bill makes fun of one of the gaudier-looking manors, generally agreed by locals to be the lake's biggest eyesore. A colossus of a thing, all weird angles and too much height, jutting out over a bend in the shoreline. They tell me about the mysterious millionaire (billionaire?) who bought the small island in the middle of the lake. Built a property up from scratch, and a low stone wall around it to fence himself in. Completely isolated. An empire of solitude and beauty inhabited a mere two weeks a year. 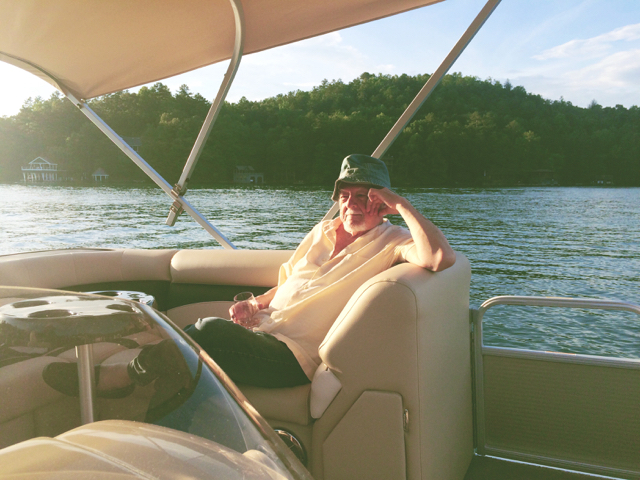 Back in the main body of the lake, we speed up. Woody drives us to where, over the fourth of July, everyone gathers to watch fireworks. Hundreds of boats. So much water traffic it takes hours to disperse afterword. Later Hannah will describe how, when the fireworks end, all the boats starting up at once is a chaos of rumbling motors and backsplashing. I decided I only needed to see that once, she'll laugh. 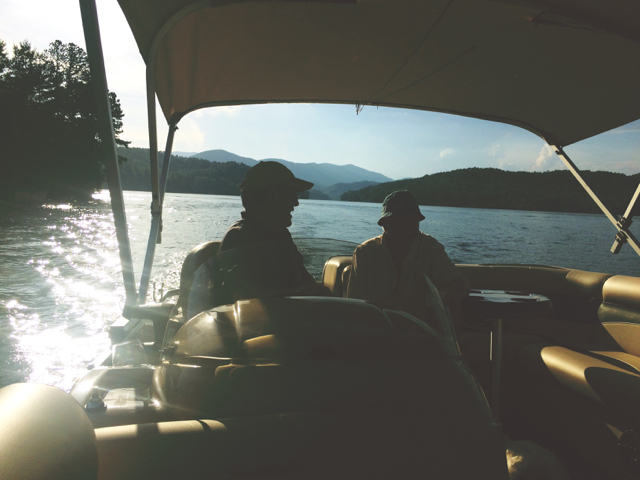 Noisy holidays and eccentric outsiders notwithstanding, these people love their home and their lake. They love sharing it, and showing off its many wonders. I'm suitably impressed and incredibly grateful to be here - but my gratitude has less to do with the view than with the company I'm keeping.